Even the most jaded of world travelers cannot approach ancient Greece's most iconic attraction without being awestruck. Crowning a dramatic limestone crag, the Acropolis stands high above modern Athens as a symbol of the city's former glory, recalling the culture that flourished more than two millennia ago. In addition to the Parthenon, you'll find many more things to do among these emblematic ancient ruins. While wandering around the many archaeological remains of the Acropolis, tourists follow in the footsteps of Socrates, Pericles, and Sophocles and discover the building blocks of Western Civilization. Before entering the ticketed admission area of the Acropolis, tourists may visit the Odeon of Herodes Atticus. This ancient theater is named after Herodes Atticus of Marathon (outside of Athens), who built it in memory of his wife Regilla in AD 161. The theater was designed with an auditorium fitted into a natural hollow. Semicircular rows of seating could accommodate nearly 5,000 people. The orchestra was originally located in the circular space in the center with the low stage (skene) close to it on one side. Between the auditorium and the stage were open passages for the entrance of the choir (parodoi). Live performances are still held at this theater during the summertime. The Athens & Epidaurus Festival presents classical Greek operas as well as musical and dance performances, offering tourists the magical experience of watching two-thousand-year-old drama in the original theater. After passing through the admission area, tourists enter the Acropolis site through the Beulé Gate. This Roman-era doorway was named after the 19th-century French archaeologist who discovered it. The Beulé Gate is below the west side of the Propylaia, the majestic entrance to the Acropolis. Featuring two flanking towers, the gate dates to 280 BC and was originally linked to the Propylaia by a broad marble staircase built during the reign of the Emperor Septimius Severus. Part of the lower section of the staircase has survived. Beyond the Beulé Gate, on the way up to the Propylaia, tourists come across the Monument of Agrippa. This tall, rectangular two-color marble plinth was built in the second century BC for a benefactor of Athens, perhaps the King of Pergamon, the marvelous ancient city (now part of present-day Turkey). The monument is named after Marcus Agrippa, the son-in-law of Augustus, because a bronze sculptural representation of his four-horse chariot (quadriga) was mounted on the base in 27 BC. An ordinary entrance gate would not suffice for the glorious ancient city of the Acropolis. This majestic entranceway set the tone for arriving visitors, preparing them for the jaw-dropping site of the Parthenon and the other monumental temples on the rocky hilltop above. The Propylaia was built by Mnesikles in 437 BC to 432 BC. First, a flight of marble steps leads up to a vestibule containing five gateways, which increase in width and height from the sides to the center. To the west is a deep portico, with a central doorway framed in Ionic columns. Along the front of this portico are six Doric columns, which originally supported the pediment. On the east side is a smaller but still impressive portico also with Doric columns. The multifaceted architectural complex, featuring intricate details, contributes to an overall sense of grandeur. The Temple of Athena Nike is the most elegant and well-preserved of the Acropolis buildings, having been restored in the 19th and 20th centuries. Standing on a spur of rock on the south side of the Propylaia, this ancient sanctuary was dedicated to the Goddess Athena as the bringer of Victory (Nike). The temple was built between 432 BC to 421 BC, after the completion of the Parthenon and the Propylaia. The temple features four delicately carved Ionic columns at the north and south ends. The form of the column bases and capitals was old-fashioned at the time they were built, leading archaeologists to suggest that the architecture was influenced by the earlier design of Kallikrates. The balustrade that once adorned the temple platform is now on display at the Acropolis Museum, along with relief figures of Athena and several representations of Nike (the Goddess of Victory). Standing majestically on the highest point of the Acropolis hilltop, this breathtaking temple was the most magnificent temple of the ancient world. For the best views of the Parthenon from a distance, go to Philopappou Hill directly across from the Acropolis. The temple was built from 447 BC to 338 BC during Pericles' construction boom and is a masterpiece of the architect Iktinos and the great sculptor Phidias. As the ultimate sacred shrine in the city, the temple venerated the cult of Athena the Virgin (Athena Parthenos), the Goddess of Wisdom and Warfare and the Guardian of Athens. Exemplifying classical style, the temple features 136 fluted Doric columns (in repeated rows of 8 x 17), creating a sense of harmony and order. Notice how the columns are slightly bulkier at the base and the shape gradually narrows towards the top. Each 10.5-meter-high column has a diameter of 1.9 meters at the foot and 1.5 meters at the top, an ingenious technique, which creates the optical illusion of a perfectly balanced building. Otherwise the temple would appear top heavy. Although the interior of the Parthenon is off limits, tourists may walk around the exterior to admire the structure from every angle. The temple's monumental scale and remarkable details of craftsmanship are awe-inspiring. At the east end, the pediments depict the Birth of Athena from the head of Zeus. At the west end, the pediments illustrate the conflict between Athena and Poseidon for the land of Attica. Originally, the temple had a roof that was covered with marble tiles with run-offs for rainwater at its four corners. After serving as a temple for around 900 years, the Parthenon suffered considerable damage in the fifth century when it was transformed into a Christian church dedicated to the Virgin. The Parthenon remained in use as a church for another 950 years before becoming a Turkish mosque in 1456. Unfortunately, the temple, which had stood for more than 2,100 years was destroyed by a bomb during fighting between the Venetians and the Turks in the 17th century. Today, the ruins of this massive structure remain as testimony to its former glory. Built from 421 BC to 395 BC, the Erechtheion complex contains a number of ancient sanctuaries. The eastern part was occupied by a sanctuary built a century earlier, the Temple of Athena Polias. In the western part was the Tomb of King Erechtheus. One of the most famous features of the Erechtheion is the Porch of the Caryatids, six columns sculpted as figures of maidens in place of ordinary columns. The Tomb of Kekrops, the founder of the Athenian royal line, was located under the Porch of the Caryatids. From the north portico, a side doorway leads into the adjoining cult precinct of the Pandroseion. Found immediately south of the main Erechtheion sanctuaries, the Old Temple of Athena was built in the early sixth century BC within the precincts of the Mycenaean royal palace of the 14th century BC. (The only remaining architectural elements of the Mycenaean palace are two column bases.) This temple was the sanctuary of Athena Polias (Athena of the City), the patron of the city. The temple held the venerated wooden Cult Image of the Goddess (Xoanon), in a tradition that most likely dated back to Mycenaean times. The Old Temple of Athena was destroyed by the Persians in 480 BC along with all the other buildings of the Archaic period. It was not until the 19th century that the foundations of the temple were uncovered by archaeologists. The Pandroseion lies between the Erechtheion and the Old Temple of Athena Polias. This small temple was named after Pandrosos, the daughter of the first king of Athens. The temple contained the altar of Zeus Herkeios (protector of the hearth) and a shrine to Pandrosos. Scholars believe that the sacred snakes of the Acropolis were kept here. Also, according to legend, Athena presented the sacred olive tree to the city here after her victory over Poseidon in the contest for the land of Attica. The fifth-century BC Greek historian Herodotus tells us that on the day after the destruction of the Acropolis by the Persians in 480 BC, a fresh shoot had sprung from the trunk of the burned tree. This tree became a symbol of Athens' survival. As a tribute to this ancient event, an olive tree was planted here in modern times. The Acropolis Museum is a must-see cultural attraction in Athens that opened in 2009. Below the Acropolis hill, about 300 meters away from the archaeological site, this incomparable museum contains one of Athens' most valuable collections of ancient Greek art. In front of the museum is a designated archaeological site where archaeologists can be seen at work. After walking past this "archeological workshop," tourists arrive at the entrance to the sleek modern building designed by architects Bernard Tschumi and Michael Photiadis. Illuminated by natural light, the extensive exhibition galleries display around 4,000 priceless objects. Most of the items in the collection were uncovered at the Acropolis archaeological sites. The collection spans the Archaic Period, from the seventh century BC to the fifth century BC, and the Classical Period, from the fifth century BC to the second century BC. Highlights are the original Caryatids from the Erechtheion, the sixth-century-BC Moschophoros statue of a young man carrying a small calf, the fifth-century-BC relief of Mourning Athena, and the series of reliefs from the Temple of Athena. Near the Acropolis Museum is the fourth-century-BC Theater of Dionysus, which has a separate ticketed entrance from the rest of the Acropolis. 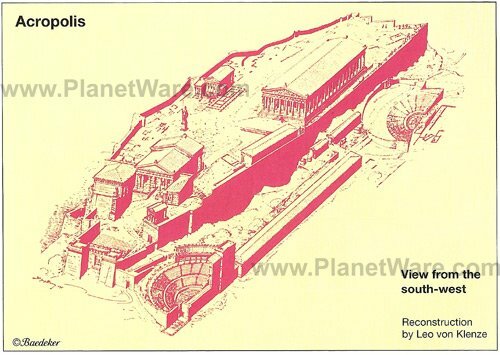 (The Acropolis admission ticket includes entrance to this site, but it's possible to buy a cheaper ticket just to enter the Theater of Dionysus.) The fourth-century-BC Theater of Dionysos is the oldest of the three architectural complexes built on the southern slopes of the Acropolis (Areopagitou Street). The great Greek tragedies of Sophocles and Euripides were performed here. Near the Theater of Dionysos is the Stoa of Eumenes, built by King Eumenes II (197-160 BC) of Pergamon, a city of the Hellenistic period located in present-day Turkey. King Eumenes was renowned for founding a city filled with impressive buildings, including the Great Altar of Pergamon. AVA Hotel Athens: luxury boutique hotel, fantastic location, elegant decor, shopping and restaurants nearby, hot tub. MET34 Athens Hotel: 4-star boutique hotel, stylish design, rooms and suites with kitchenettes, breakfast included, welcome drinks, concierge. InnAthens: mid-range pricing, century-old Neoclassical building, outstanding staff, minimalist room decor, excellent breakfast with traditional produce. Marble House: budget hotel, great location, family run, residential area. Tours of the Acropolis: On the comprehensive 3.5-hour Athens Half-Day Sightseeing Tour, you'll explore the city's highlights with a knowledgeable local guide, ending with a walking tour of the Acropolis. 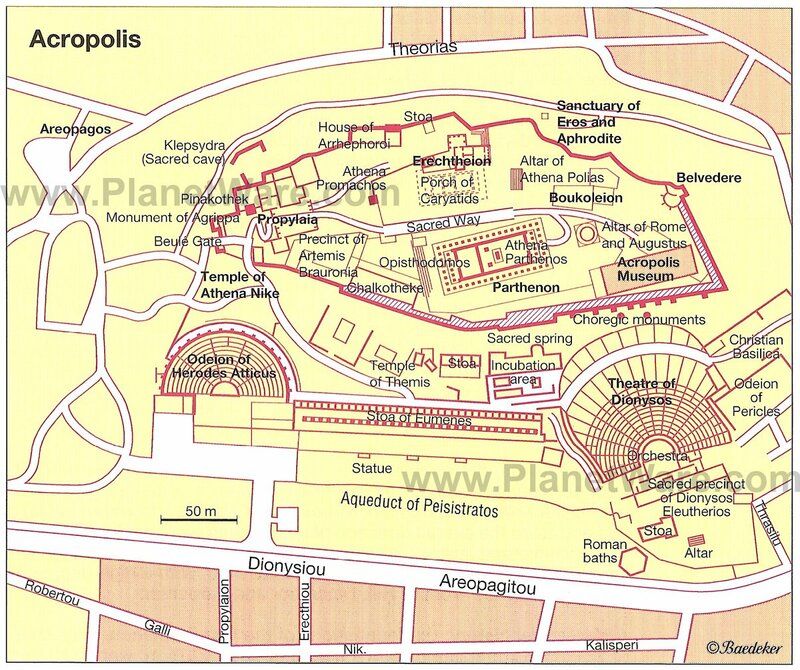 You can upgrade this tour to include entrance to the Acropolis Museum. Visiting the Acropolis on Your Own: While you can buy a ticket just for the Acropolis, it is also included in a comprehensive ticket that includes the Ancient Agora, the Archaeological Site of Lykeion, Hadrian's Library, the Roman Agora, and several other ancient sites. You cannot buy advance tickets, but you can save time on busy days by purchasing a comprehensive ticket at one of the less crowded sites where there are no waiting lines. With that you can skip the line at the Acropolis. Comfort and Safety: Because the Acropolis sits on a steep hill and its ancient stones are worn and uneven, wear comfortable low-heeled shoes with rubber soles for sightseeing. Drinks are not easily available, so be sure to carry plenty of water, especially in the summer. Where to Eat: The museum has a café and restaurant with stunning views of the ancient ruins on the Acropolis hilltop. If you exit on the northern side, you'll be close to the charming neighborhoods of Anafiotika and Plaka, which are filled with restaurants and cafés hidden in a delightful maze of winding pedestrian streets.